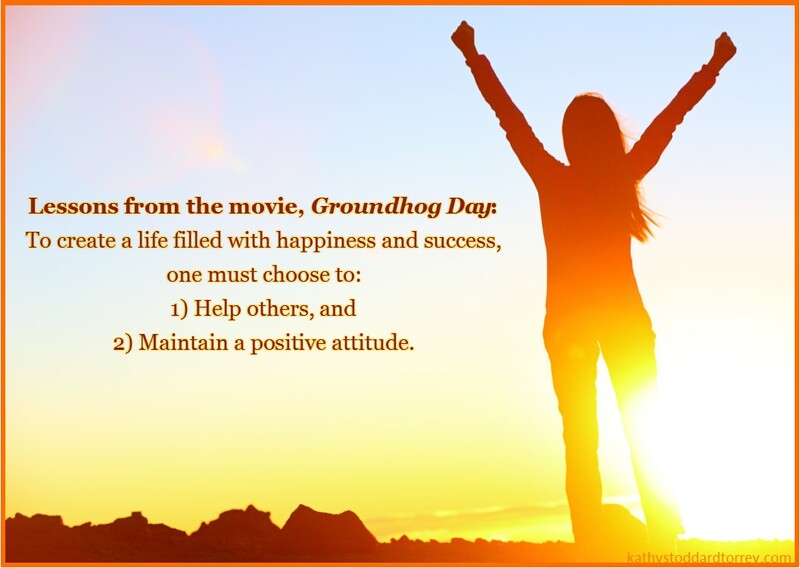 I was reminded of two lessons when I watched Groundhog Day on Groundhog Day. I knew these two things helped to create happiness and success in life, but the main character, Phil, embodied them in such a great way that made the lessons really hit home. If you haven’t seen the movie, Phil is played by Bill Murray and his love interest, Rita, is played by Andie MacDowell. Now you can visualize them easily. Phil is stuck in the same day, Groundhog Day. He wakes up every morning to the same Sonny and Cher song on the radio and relives the same day. He goes through the expected stages. First is disbelief; he thinks he’s going crazy. Next he uses the information about the day to his advantage. He robs an armored car. He learns everything he can about Rita and tries to use the information to get in her good graces. It doesn’t work. Phil isn’t a nice guy and he proves it in this phase. Then he becomes depressed and kills himself, and on one occasion the groundhog, in several different ways. However, no matter what he does, he keeps waking up to Sonny and Cher. I read online that someone figured out that he lived the same day for over eight years. Talk about a rut! The things he’s been doing, which are expressions of how he has lived his life up to this point, are not creating success and happiness. Finally, Phil makes a shift. He makes two changes and I think it’s beneficial, if not absolutely necessary, to do one before the other. The first thing he did was decide to have a positive attitude. Up to this point, he has interacted with the same people and had basically the same conversations for eight years, and none of them were pleasant. Once Phil changes his attitude people feel better after they talk with him instead of feeling worse. Phil listens and takes other peoples’ opinions into consideration. He smiles and is pleasant. Phil becomes a positive force in the world that buoys other people instead of making them insecure and dragging them down. Instead of dreading a conversation with Phil, people look forward to talking with him. As a general rule, we all like being around positive people. We are attracted to them. People began to find Phil attractive! The second change that Phil made was just as significant, but hard to do if you don’t have a positive outlook. Phil began to take care of other people. It started when he found a homeless man on the street one night who later died at the hospital where Phil took him. From that point on, Phil adopted a “No one is going to die on my day!” attitude and took action. Every day, he caught a young boy falling out of a tree, saved the mayor from choking, fed the homeless man, and even changed the tire of a group of little old ladies. He spent his day helping other people and felt satisfaction, gratification, and happiness as a result. There is a Groundhog Day party at the end of Phil’s day. In the beginning he refused to go, even mocked the party as ridiculous. After he decided to be positive and help others, he became the center of attention at the party. The mayor’s wife kisses him and says what a wonderful person that he is. The three little old ladies speak of him glowingly. He’s even been taking piano lessons and his piano teacher who believes that she’s only seen him on this one day, says what a great person he is. His new emphasis on positivity and helping others changes how Rita sees him. Remember, it’s a fresh day for her and she has no memory of all the others that Phil has lived. When she got up on this last of Phil’s Groundhog Days, she expected him to be the same jerk he was the day before. Instead, she is taken by his positivity and kindness. He is not trying to impress her at that point and yet he does. By focusing on becoming positive and helping others, he’s achieved the goal that he had in the very beginning, winning Rita’s heart. He became attractive to her by focusing on his own personal growth. Each of us can become more attractive as well if we work like Phil did to cultivate a positive attitude and genuine determination to help others. Everyone around us would benefit from that course of action, but people who would benefit the most are us. One of my favorite films… and there are so much to learn each time I watch it 🙂 Thank you for this interesting post!